Agent Orange's green minded cousin! Agent Apple was created because people asked us for an alcohol based super powerful degreaser - to get any metal part shiny like new. Re-created for 2018 to be re-usable, Agent Apple Extreme Immersion Degreaser is perhaps the most powerful bike degreaser available. We wanted to make a citrus degreaser without the petrochemicals and dirty smell, from sustainable ingredients. Plant based alcohol made from EU grown sugar, fermented apple extracts and orange peel extract make Agent Apple Extreme Immersion degreaser the strongest on the market. Why degrease your chain and cassette? Layer upon layer of chain lube can build up into a mess. Pollution in the air can pollute your chain, and mud and road dirt can also make it dirty. A clean chain with oil can be over 99% efficient. The ‘grinding paste’ you see on some chains can be completely destroyed by immersing it in Agent Apple, along with light use of a toothbrush. 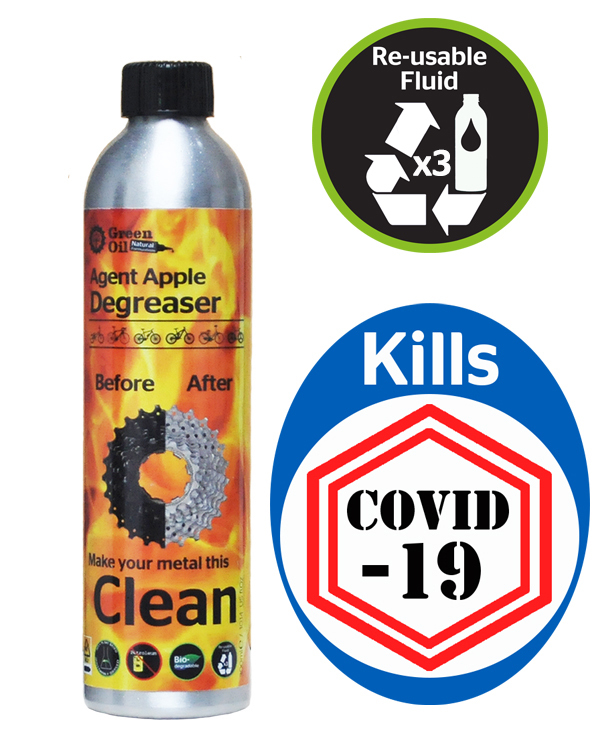 Agent Apple Extreme Degreaser may discolour non-metallic items, and damage carbon fibre. It smells like vodka and orange but don't drink it - we've included an eco-friendly molecule called denatonium benzoate to make it taste bitter. Great if you live with pets, children, or that mate Dave who drinks too much. To our knowledge, Agent Apple is so strong it's the World's first re-useable bike degreaser. It can be used over 3 times. 1. Remove the chain or other item to be degreased and put into the pot or cut milk bottle for immersion. An old 4 pint organic cow milk bottle works best - it is just larger than most bike cassettes and a bike chain. An Eco Rider Deluxe Set tub is also great, especially for front sprockets. Ice cream tubs do not work. Generally made from compressed polystyrene, Agent Apple is too strong for it these weaker plastics. 2. Pour Agent Apple over the item to be degreased, immersing it if possible. Be liberal, you can pour Agent Apple back into the bottle after. Top Tip: If degreasing a chain, make it into the flattest spiral you can. Again, a 4 pint organic cow milk bottle is best. 3. Leave the item in Agent Apple for two hours. You can see it get to work within 5 minutes, breaking off grime. 4. Get a small old toothbrush and lightly scrub off any remaining bits of grime. 5. Thoroughly rinse the now clean metal part. A high powered tap is ideal. Go green and use rain water if you can! 6. Let the grime settle at the bottom of the container. Next, slowly pour from the top of the container into the Agent Apple bottle, until only the black grime is left. The Agent Apple can be used again and again! 7. Pour the black grime into an old bottle, and put in the non-recycling bin. If you've only been using Green Oil products on your bike, you can pour this black grime onto a compost heap - it will just contain biodegradable lube, road dirt and degreaser, so will biodegrade within 28 days. How is Agent Apple Extreme Immersion Degreaser green? - Agent Apple's formula is plant based, and biodegradable. - Although not recycled, the bottle is easily recyclable. You can even return it to us for cash. - Agent Apple is biodegradable after its life on your bike. It is hazardous due to the d-limonene and alcohol content, but evaporates quickly, and is only harmful to the environment if poured straight into a river or other water body with fish in. It disperses and biodegrades, and further, it is re-useable. At less than ten parts per million, denatonium benzoates is used to make it taste bitter. This is environmentally inert, safe, and food safe, though not technically biodegradable. This eco friendly molecule is used by other green companies including Ecover. The name is inspired by Agent Orange - the nick name for a very nasty chemical used to clear jungle, which has a hugely negative health affect on people and the environment even today. Agent Apple is environmentally friendly and clears grime and grease instead of forests! Its like Agent Orange's eco friendly little cousin, and does good by reducing petrochemical use. If you'd like to help the people in Vietnam, visit Children of Vietnam, or Save the Children. Green Oil UK Limited will pay you 20p in cash for your old Agent Apple degreaser bottle at selected trade shows. Selected retailers will refill your bottle for a 10p discount. This concept is widespread in most countries where deposit bottles are used for beer and other drinks. See us at the next trade show for your 20p in cash, or bring 5 empty bottles for a free Green Oil gift! You can of course recycle your Agent Apple bottle. The whole thing is aluminium except a little bit of sponge in the cap which can be taken out easily with a knife. The label is polypropylene and will burn away cleanly when the bottle is melted for recycling.